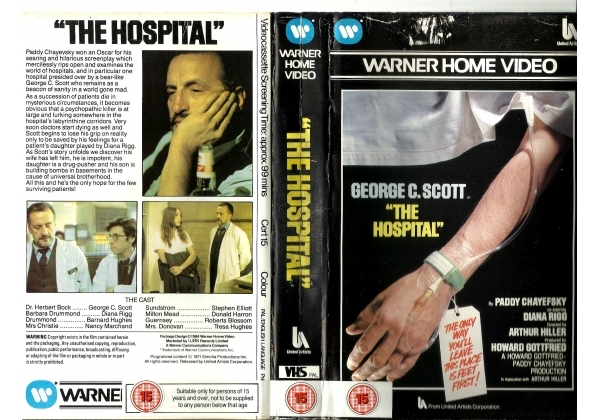 Paddy Chayevsky won an Oscar for his searing and hilarious screenplay which mercilessly rips open and examines the world of hospitals, and in particular one hospital presided over by a bear-like George C. Scott who remains as a beacon of sanity in a world gone mad. As a succession of patients die in mysterious circumstances, it becomes obvious that a psychopathic killer is at large and lurking somewhere in the hospital's labyrinthine corridors. Very soon doctors start dying as well and Scott begins to lose his grip on reality only to be saved by his feelings for a patient's daughter played by Diana Rigg. As Scott's story unfolds we discover his wife has left him, he is impotent, his daughter is a drug-pusher and his son is building bombs in basements in the cause of universal brotherhood. All this and he's the only hope for the surviving patients! Official Run Time: 99 mins. Or find "Hospital, The" on VHS and DVD / BluRay at Amazon.